Zanskar, the region between Kargil and Lamayuru in the north and Kishtwar and Manali in the south is, at the moment, an ideal trekking area. The new road from Kargil over the Pensi La to Padum will bring a post office, bank and even a phone connection to the Zanskar capital but at present, you will find none of these or any hotels. Nor will you find military installations and soldiers, a common part of the scene in Ladakh. The most you’ll come across is a mounted patrol or pony-caravan of the J&K Police. As for foreign visitors they are still few and far and far between in this far ‘off the beaten track’ Himalayas valley. The valley is about 300 km and is unusual in that access is only by high passes from the sides. A unique feature of the Zanskar area is the twin of Nun and Kun. 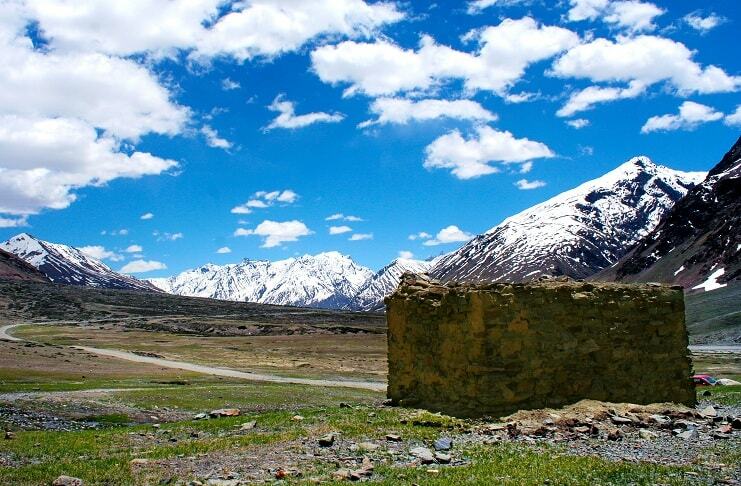 Anyone intending to trek in Zanskar Valley should be completely outfitted in Srinagar or, at the latest, Kargil. Very little will be found in Padum and in the small villages along the trail it is not easy to buy even Tsampa meal. If you have porters or pony-leaders you should ensure that they feed themselves. Most important you must take sufficient kerosene (and ensure the containers do not leak!) since there is very little fuel for burning. Westerner’s should take along tinned meat and other food suitable for strenuous walking at altitudes from 3000 to 5000 meters. A larger group could take along a sheep as live meat. If you wish to (or have to) survive Zanskari style you should bring Tsampa (roasted grain) with tea, water and Chang. A kind of noodle known as Pakthuk can be prepared for a change and Tsmpa can also be baked as flatbread called Takir or, in Tibetan, Pakleb. Chuli Pak is a real Zanskari appetizer – it consists of apricots (Chuli) cooked in butter (hopefully not rancid), which is then eaten with flatbread for breakfast. Clothing and equipment should be packed in a rucksack kitbag, the latter are easier to transport on pony back. Waterproof individual items by putting them in dust bags sealed with rubber loops. A sturdy stick is important, especially for crossing streams. Light canvas running shoes with rubber soles are recommended for trekking; they dry quickly after crossing steams. In no circumstance try to cross streams or rivers barefoot. Take a sun hat but ensures it stays firmly in place or it will sun be blown away. Important if you want to ovoid burnt, dry lips. Very important in the high mountains – good quality and 85% filter factor. Make sure the tent is waterproof; some monsoon rain creep over the mountain barrier and bring heavy downpours. Ponies are indispensable for riding and haulage in the Kashmir Valley, particularly on the Pahalgam-Amarnath trek, and in Ladakh, particularly on the Pahalgam, they are often made of iron: hard, inflexible, awkward and with just a little leather on top. In either case riding rapidly becomes impossible, but not only are the saddles a nightmare, the bridle and stirrups are equally bad. In fact stirrups are often completely lacking o Suru Valley and Zanskar ponies and the bridle may be simply a loose rope tied around the animal’s neck. A tall westerner, with his legs reaching almost to the ground, looks like Don Quixote! The reason for this poor equipment is quite simple – apart from water crossings ponies are primarily used only as beasts of burden and rarely ridden. If you wish to use your own saddle it is not necessary to bring it with you since saddles are sold in the neighbourhood of the Shah Hamadan Mosque in Srinagar. They can easily be resold after you complete you pony trek. In choosing a pony, if you should be so fortunate as to have a choice, considering the limited number available, pay close attention to the rear and withers. Otherwise, you will have an uncomfortable time on horseback. Forget whatever you known about horse when viewing these animals – they fly in the face of our preconceptions and are unbelievably nimble and surefooted. If you decide to entrust yourself such a ‘disguised deer’ do not try to steer them, they find their own way with remarkable certainly. If you do want to direct the pony with the reins (they do not seem to understand hints on the shanks) them give a gentle indication and allow one or two seconds reaction time. They’re not machines with instantaneous reactions! Over strenuous tugging at there in leads to defensive resistance. Allow the ponies sufficiently long rest stops and opportunities to relax. The animals don’t always find enough food at overnight halting places (at least in Zanskar) so they are allowed or wander in search of food at night. Don’t blame the horse-drivers if it takes some time to round them up in the morning. The mid-day stop should, if possible, be at a place where ponies can graze. Unload them at this time and remove the saddles, you will see the ponies roll on their backs to reduce the flatulence caused by the tight belly band. The pause should not be too short or, further down the trail, the docile beasts may suddenly decide to throw off their load or rider and settle down to some serious grazing. Bear in mind that the smell of westerners is still unusual to Zanskari horse. A local horse-leader can be very reassuring for the ponies but if you ride alone it is important to tether your pony during stops. Otherwise, it will gallop off home at the first opportunity. The lightly tinkling bells found around the neck of Zanskari horses drown out the noise of falling stones and reassure the horses. Despite such precautions against panic horses do sometimes fall, as happened on our trek from Zangla to Nerang (see Padum-Lamayuru Trek) when our houses was drowned. This is naturally seen as a bad omen for the trip a porters and horses-drivers may desert you after such an accident. Financial compensation for the dead animal will help, it is often the horse-driver’s sole possession. You must reckon on Rs.1000 to 2000. In general Zanskari horses and porters are more reliable than those from Kashmir. For horses from the Suru Valley the rope suspension bridges at Padum constitute an insurmountable obstacle on a trek to Zanskar and you will have to switch to Zanskari horses from Thonde or Zangla. They are able to get across these frightening bridges. Many porters from then Kashmir Valley are unwilling to go beyond Padum since they are unused to the high altitude passes (5000 meters) on the trek to Lamayuru, Leh or Manali. Gostor on the 25th-29th days of the 11th month of the Tibetan calendar – usually in the first week in January, features Cham dance with masks. Gostor form the 29th day of the 11th month of the Tibetan calendar – it follows the end of the Karsha Gosto. Gersta on the 15th day of the fourth month (usually the first week in June), features Cham dance with mask. This is the only Zanskar festival that takes place in the summer; the Hemis festival in Ladakh takes place at the same time and is similarly the only Ladakh summer festival. Zongkhul Huchot takes place on the 16th and 17the days of the fourth month but there are no mask dances. Sani Nasjal takes place between the 15th and 20th days of the sixth Tibetan month, usually the first week in August. The festival takes place during the blooming of the ‘Guru Neropa Flower’. Anchor takes place on the 15th day of the 11th month and is, once again, only prayers. A one day prayer festival takes place on the 29th day of the 11the month, at the same time as the Karsha Gostor. The Padum Hurim or Skyrim is on the 28th and 29th day of the 11th month, at the same time as the Karsha Gostor. The Zangla Hurim is on the 28th and 29th day of the 10th month (first week) in December). On the 29th day there will be mask dance in from of the Zangla Palace. Monlam takes place on the 15th day of the first Tibetan month (February) and consist of prayers.